site on the Ili River. Getting out from the airport. 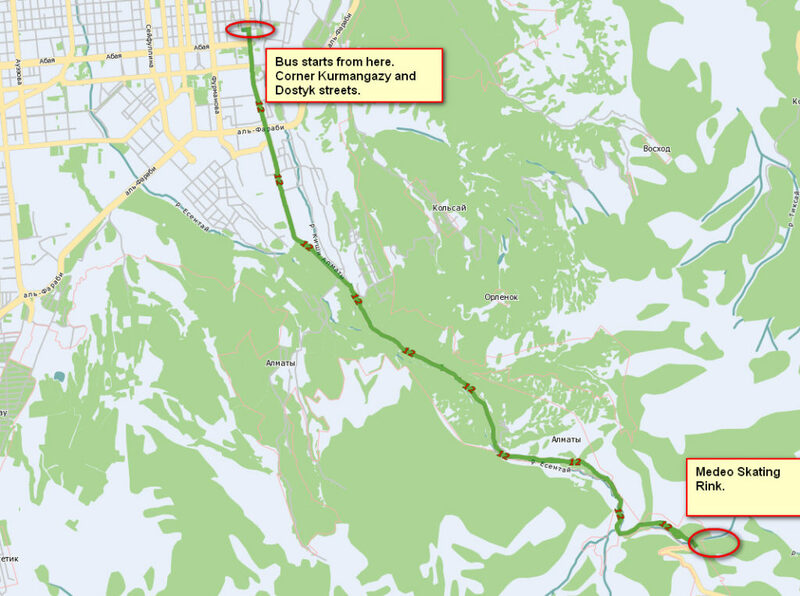 Taking a bus will be most economy way of getting from Almaty airport to your hotel. The ticket to any Almaty bus costs only 80 tenge which is less than 20 pence. From the airport you can take the bus number 92. Then choose the bus number. For example bus number 92 goes from the airport. And you will see its route and current position of each bus on this route. Going to Medeo (Shymbulak) by bus. Bus number 12 goes to Medeo Ice Skating Rink. The road will take around 40 minutes. These are the coordinated of the bus’s stop – 43.2447605,76.9565591. The stop is located just opposite Kazakhstan hotel. Actually, the rink operates only 3 winter monthes, November and March. 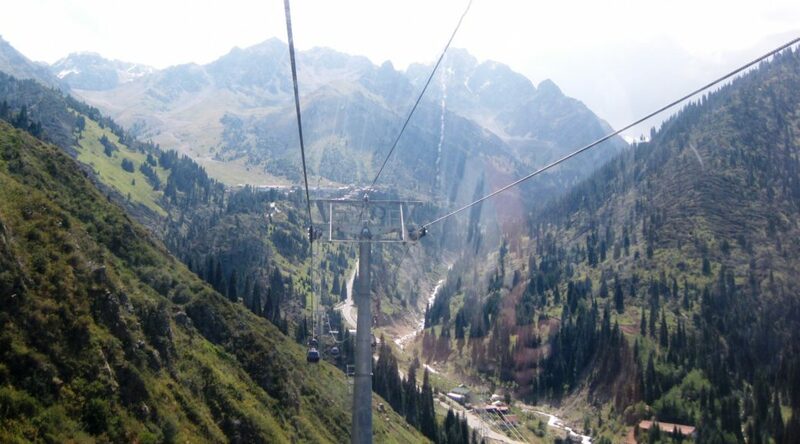 But in summer there is cable car road to Shymbulak and higher from Medeo. 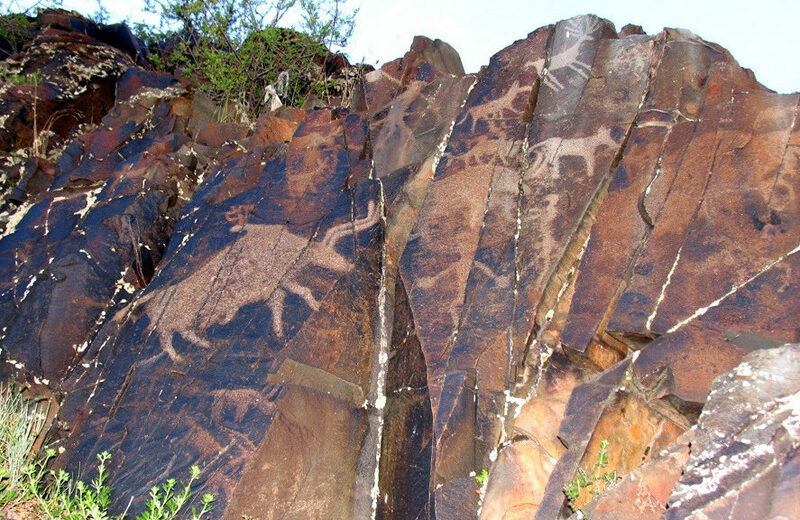 This is nuber one place you should visit while in Almaty. 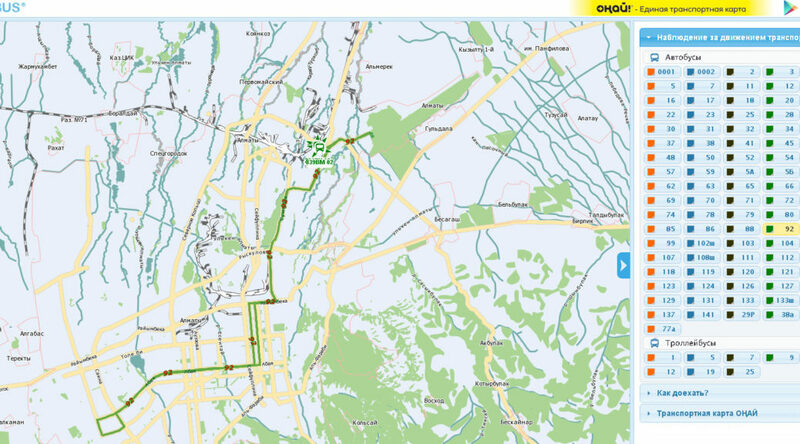 And take the cable road up to the highest point, as it consists of 3 parts: Medeo to Chimbulak, then Combi 1 and Combi 2. So buy all 3 parts at once on Medeo. It will be cheaper than if you buy each part separatly. 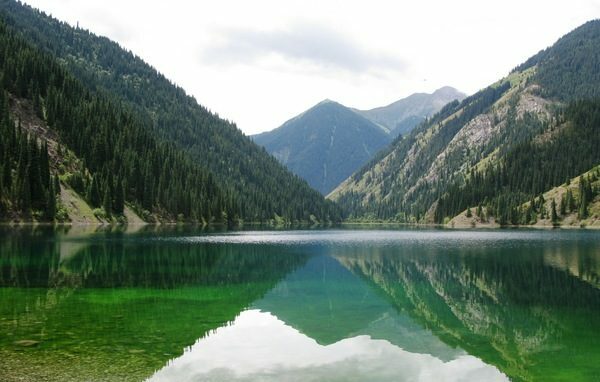 Kolsay Lakes is one of the most beautiful places in Kazakhstan 300 km from Almaty . They are called a blue necklace of Northern Tien Shan. 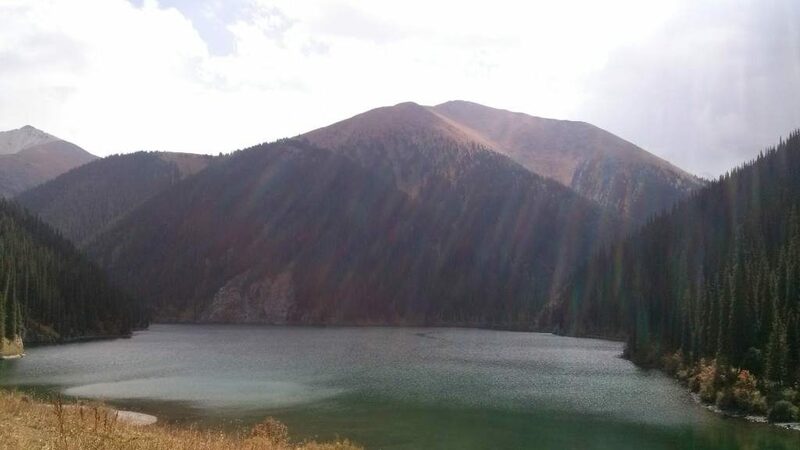 In the Kazakh language “Kolsay” means “a lake in the valley”. All three lakes are located in the eastern part of the Kungei Tau gorge. The lakes are located at 1,800m, 2,250m and 2,700m above sea level. 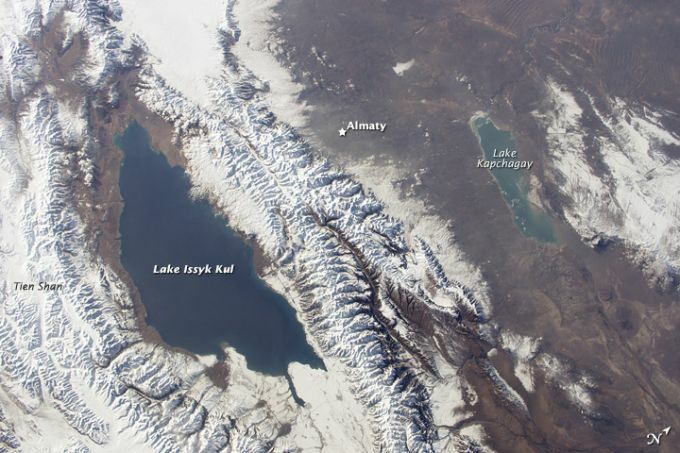 The Kolsay River originates from glaciers and makes 3 lakes: Verkhneye, Mynzholki and Nizhneye. The water in the lakes is fresh. Kolsay Lakes are very deep up to 80 meters. Kolsay Lakes are a favorite place for mountain tourism. Trekking routes to Kolsay Lakes are very easy and fit even for amateurs. Kolsay is a wonderful place for picnics, horse riding and mountain biking. A suitable period for camping is from April to late September. Along the coast of Kolsay Lakes there are all kinds of guest houses. Anyone, who is ever lucky enough to visit these places, never forgets their splendor, peace and tranquility, prevailing around. 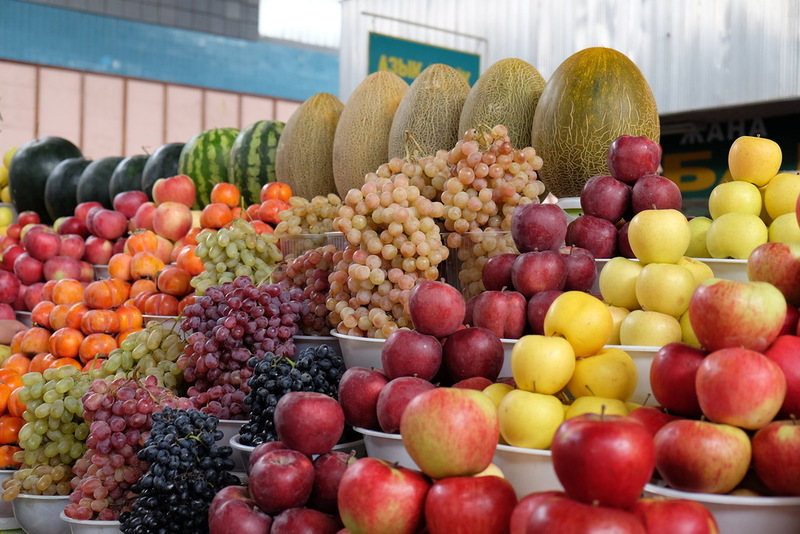 It is hot in Almaty in summer. Dry air, temparutre 30 to 40 degrees. It is no wonder why Kapchagai Reservoir is so popular among locals. 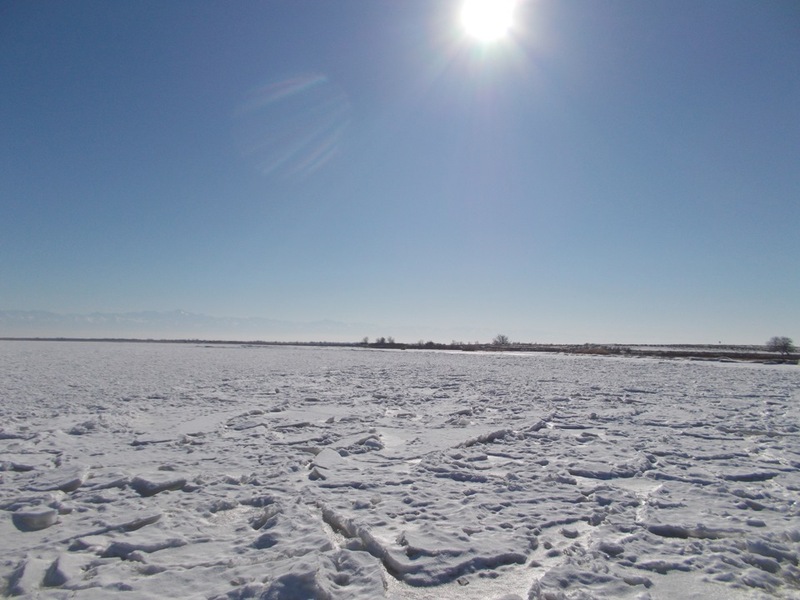 Just about 70 kilometers from Almaty. New highway road. It will take around an hour to get to the water. 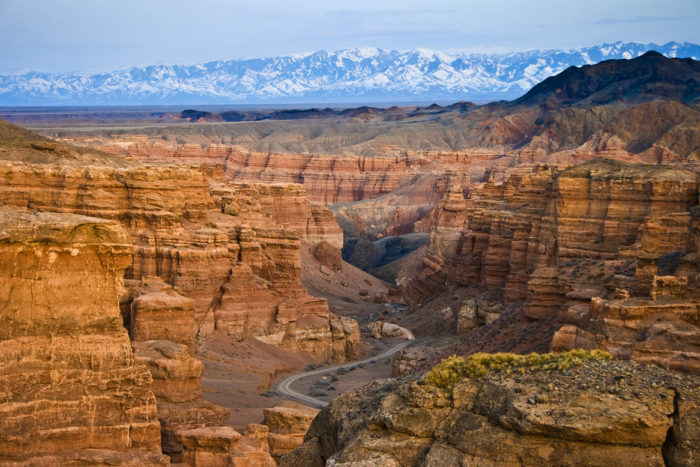 Kapchagai is also known as one of Kazakhstan’s two casino havens after gambling was forbidden throughout the country. Although minimum bids for most games tend to be high ($300-500). 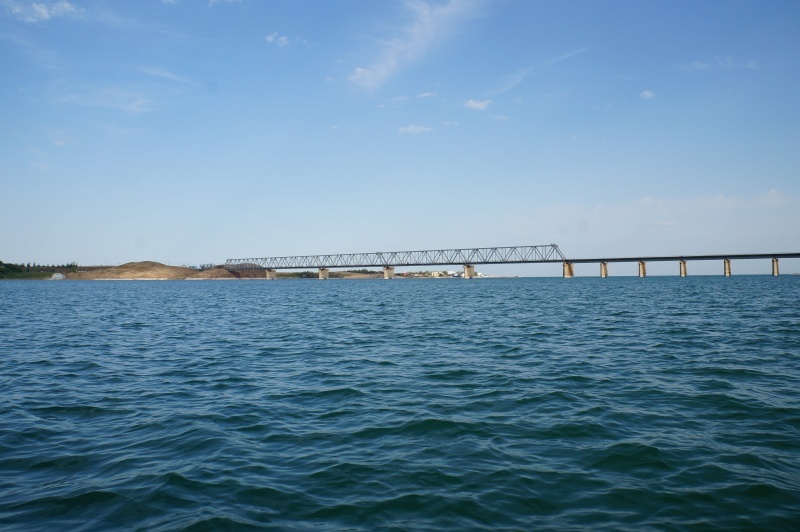 Kapchagai Lake is 100 km in length and 25 km in width. Depth is around 40 meters. Kapchagai Water Reservoir was made in 1970 by putting a dumb on ILY river. 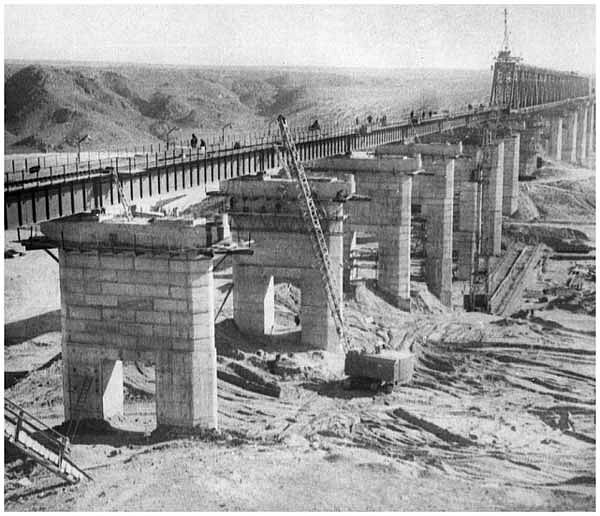 Below is photo of rail roda bridge during construction and how it looks nowdays. This is picture of Kapchagai from satellite. You can see greay area over almaty, which is polluted air (smog). 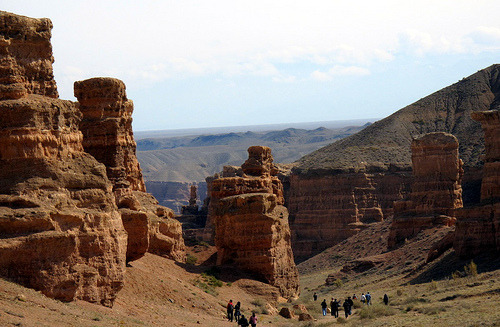 The Charyn Canyon is one of the most popular places around Almaty. It is located 200 km. east of Almaty about 3 hours drive by car. 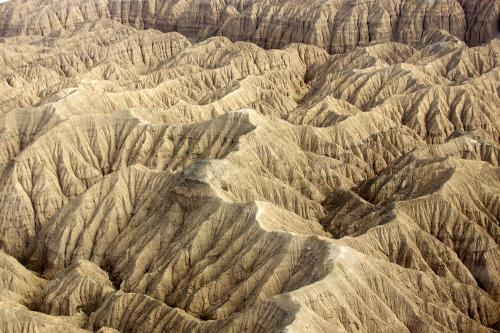 Many people compare it to the Grand Canyon of California. Of course, sizewise it’s smaller than the Grand Canyon, hence the nick name “little brother of the Grand Canyon”. The rock formations, the colours resemble that of the Grand Canyon. Although the Canyon stretches around 154 km alongside the River, the most popular part of it is only 2 km long and it’s called the Valley of Castles. Why? 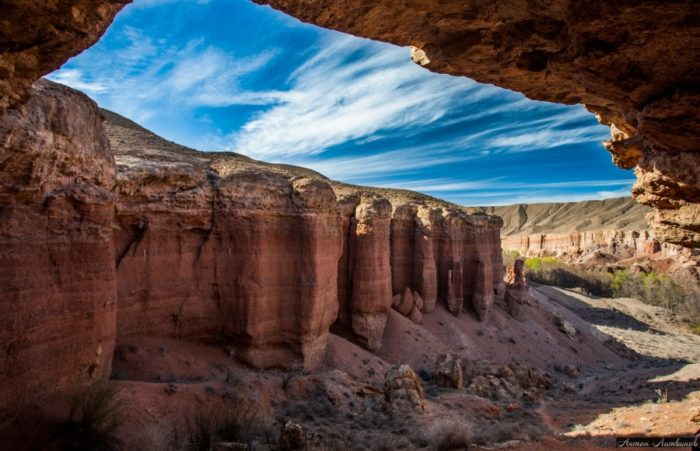 All tourist buses go to Valley of Castles, which is actuall is only one of 5 canyons which form the Grand Charyn Canyon. Temirlik Canyon with red rocks. 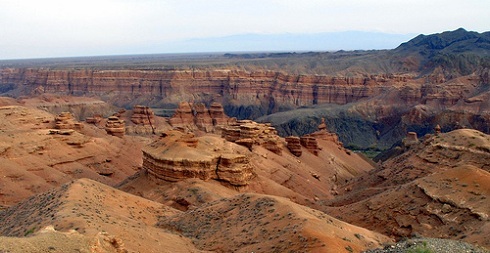 Red Canyon is located between the Charyn and Chilik rivers. 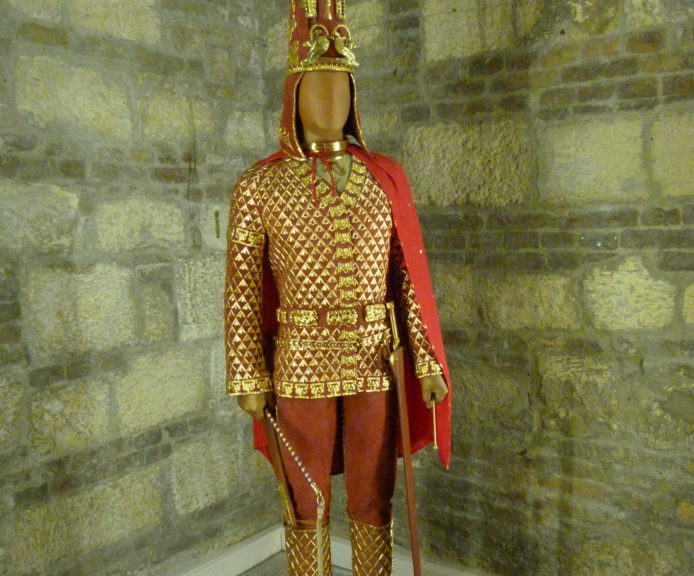 Like Temirlik, it’s bright red from the iron ore it contains. It’s on the way to Temirlik, and it’s the least impressive in terms of size and shape. Video. 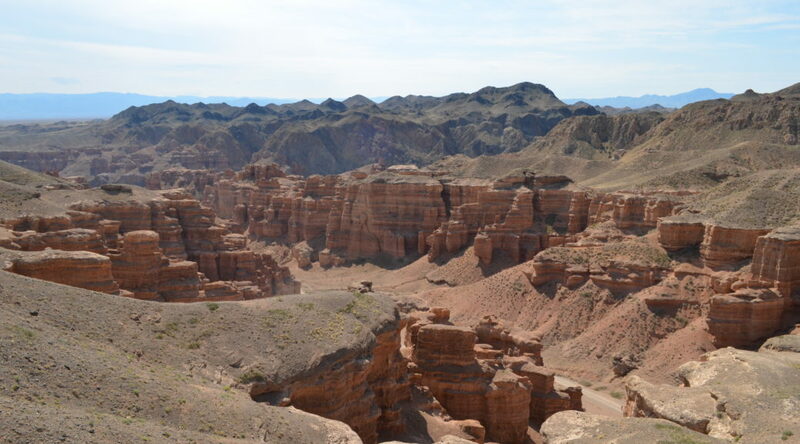 Full way to Charyn Canyon recorded on GoPro camera. 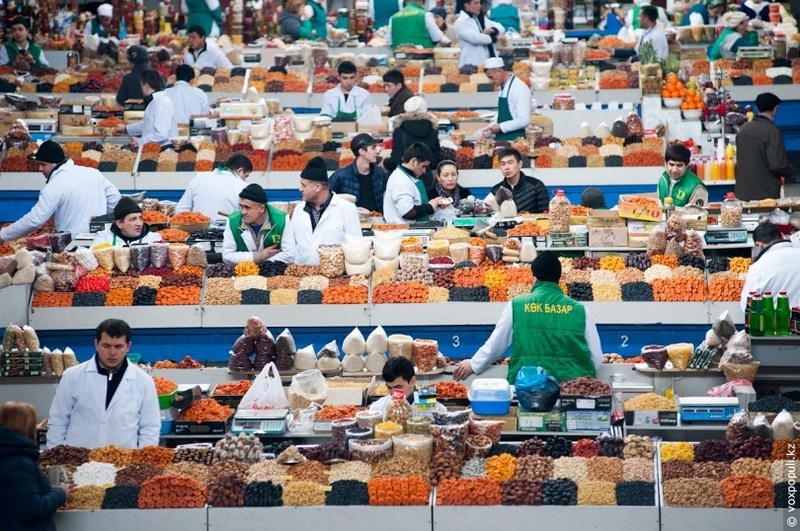 Noicy, crowded and popular place in Almaty. 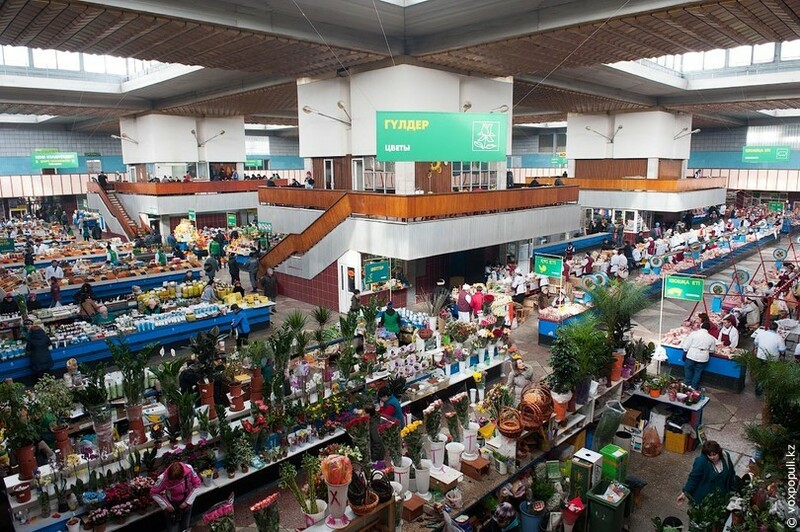 Local people visit the bazar to buy natural, fresh food. 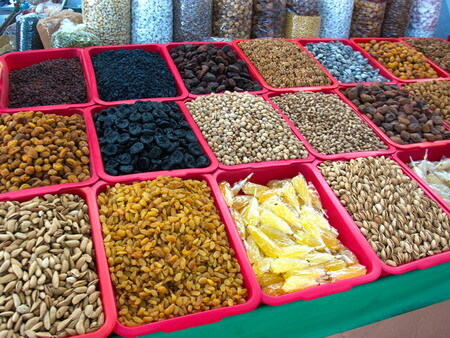 Tourist come to the Green Bazar to buy all kinds of nuts, dried fruits and honey. 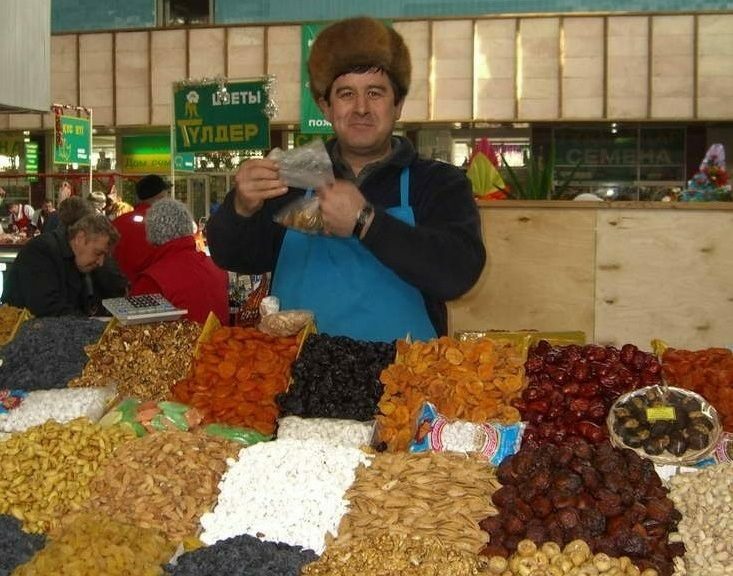 One kilo of walnut or dried fruits would cost around 10 – 15 dollars. 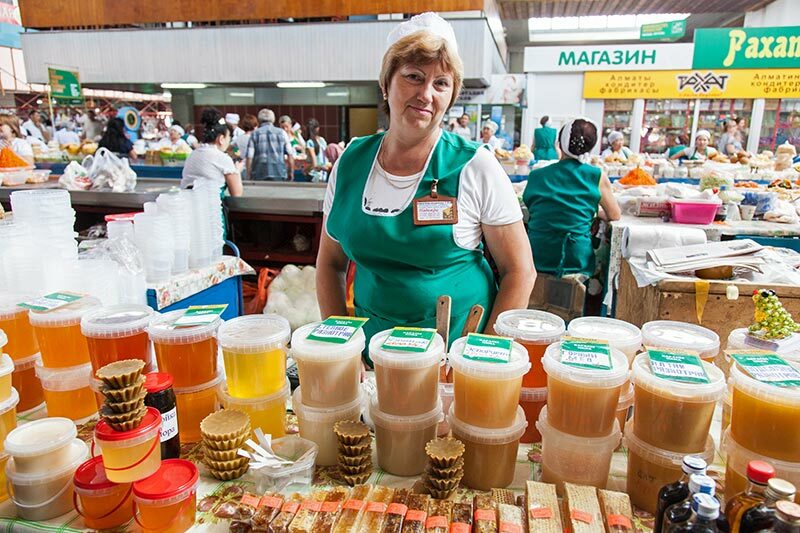 Honey will be 8 dollars per kilo. Price can be cut about 30% if you are good at bargaining.